you can order 24h a day in our online-shop. "Vielen Dank für die Übersendung der Artikel. Das Nachbau Modul funktioniert hervorragend. all vhf and uhf repaiters in Istanbul. Your tone unit worked very fine. I have a (working) Standard C520 and I am interesting in a sub-tone module in order to be able to activate repeaters. Is your CTCSS - CTN-520 REMAKE ok for this purpose? Is it a "Plug & Play" module or it needs regulations to do? (I don't have rf instruments in my lab). many thanks for mail and your request. The CTN-520 is made for the C-520 and the C-528. It is a plug and play unit so you won't have do regulations. 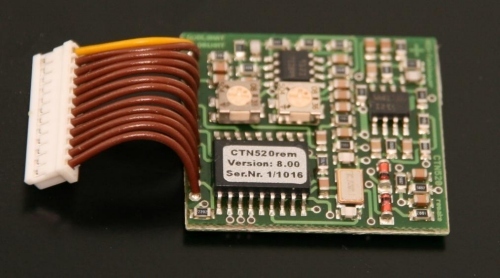 Just put the CTN-520 into your STANDARD and it is ready for qso in CTCSS-Mode.